InLine Engine is a type of engine design that is very basic and conventional. 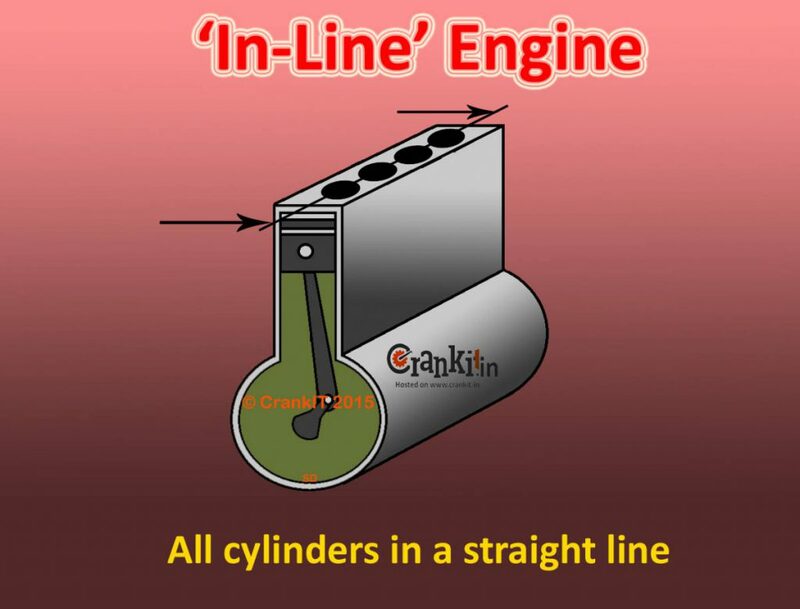 In this type of engine construction, the cylinders are placed in a straight line as shown in the diagram. As all the cylinders are in a straight line, manufacturers sometimes refer to this engine as a 'Straight Engine'. In-line engine can have upto 2, 3, 4, 5, 6 or 8 cylinders. Although, the manufacturers term an in-line engine with four cylinders as Inline-4 engine. They usually denote it by either I4 or L4 (longitudinal 4) in a car's nomenclature. However, manufacturers classify the six cylinders as straight-6 & for 8 cylinders it is straight-8 engine respectively as opposed to an inline-6 or inline-8. Many vehicular applications such as cars, light commercial vehicles, medium & heavy commercial vehicles and earth moving equipment widely use this design. This is mainly because the manufacturing cost of the in-line engines is lower than the 'V-engines'. Inline engine type is the most common type of engines in vehicles with engine capacity upto 3.0L. The Inline engine type design is simple. Hence, it is considerably easier and cheaper to manufacture than a horizontal or a ‘V’ engine. This design normally houses the engine's camshaft in the cylinder block with tappets & push-rod arrangement. The manufacturers place the engine valves either in the block next to the pistons or in the cylinder head. Most A, B & C segment passenger cars such as hatchbacks, coupes, and sedans used the in-line engines. The cars with In-line engine in A segment are Maruti Alto 800, Maruti Celerio, Tata Tiago. Cars with In-line engine in the B segment are Honda City, Toyota Corolla, Hyundai Elantra, Verna, Chevrolet Cruise etc. For more information on in-line engines, please click here.